The Oakland-based photographer makes a subtle but solid New York début. 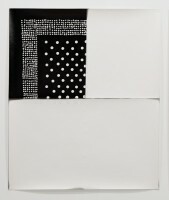 Dispensing with cameras, Mays creates monochromatic photograms based on the patterns of bandannas, one of which belonged to Georgia O’Keeffe. In several pieces, a starburst pattern repeats until it looks like fizzling sparklers. Elsewhere, paisley motifs are arranged in a loose grid gone wonky. To re-create the dots on O’Keeffe’s bandanna, Mays employed rows of pins; where the paper was unexposed to light, the heads of the pins left a ghostly design. Patterns are fragile anchors for work that is largely abstract, but Mays introduces order only to break it down.